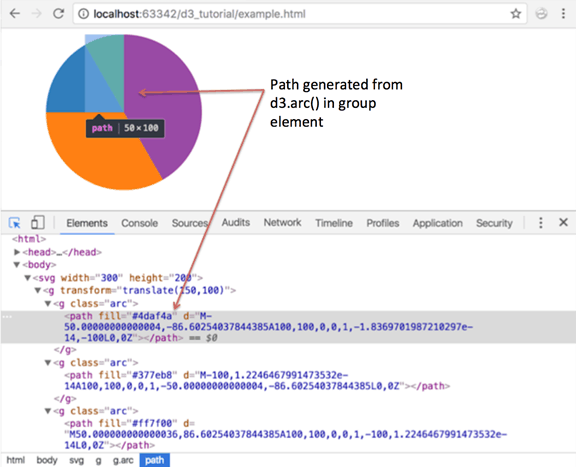 In this chapter, we will learn how to create pie charts with D3. To create our pie chart visualization, we will be using the following D3 methods. SVG Path Creates a path in SVG from the defined commands. A path element is used to create a path on the SVG. The SVG path takes commands to draw paths in SVG. The above code defines the following path starting from the point (150,0), creates a line from (150,0) to (75,200), another line from (75,200) to (225,200) and finally a closing path to (150,0). Learn more about SVG path here. We already learned about Scales in D3. The d3.scaleOrdinal() constructs a new ordinal scale with an empty domain and the specified range. In an ordinal scale, the order is of utmost importance and not the difference. In the above example, the color variable will act as a scaling function which will return specified color for the specified index. For example, color(0) will return #4daf4a, color(1) will return #377eb8 color(2) will return #ff7f00 and so on. If a value at the specified index does not exists in the specified range then it will restart from 0. i.e. range does not contain element at 5th index (index starts with 0), so it will start again from 0 and will return #4daf4a. You can read more about ordinal scale here. The d3.pie() function takes in a dataset and creates handy data for us to generate a pie chart in the SVG. It calculates the start angle and end angle for each wedge of the pie chart. These start and end angles can then be used to create actual paths for the wedges in the SVG. In the above example, we defined a d3.pie() object and provided our data to the pie function. This function calculated certain fields for the pie chart like startAngle and endAngle along with the data values. The d3.arc() generates an arc. These are the paths that will create our pie's wedges. Arcs need an inner radius and outer radius. If the inner radius is 0, the result will be a piechart, otherwise the result will be a donut chart. We need to supply these generated arcs to our SVG path elements. The following example demonstrates a simple pie chart. We first define all our variables like width of the svg and, height of the svg. We calculate the radius as Math.min(width, height) / 2 to ensure that our generated pie will fit into the bounds of the SVG. For this, we choose whichever of the width and height is the minimum value. The above code appended a group element to our SVG to group all the pie elements together. Next, we define our color scale as an ordinal scale. When we pass an index of a value in data array to the color scale, it will return the corresponding color value. This will generate our pie values like startAngle and endAngle as seen in the previous example. Next, we define our arc with an inner radius of 0 and outer radius as the radius calculated earlier. This will be used to give paths to our pie wedges. Now, we create group elements for each of our data values. This group element will hold our individual paths or wedges. And finally, we add a path element for each of our wedges. We provide the arc generated earlier and fill it with a color from our color scale. Let's now take a real dataset, read it from an external csv file and create a pie chart from this data. For this example, we will take the following dataset that we have stored in a 'browseruse.csv' file. This dataset shows the browser statistics for a dummy website. Let's create our pie chart visualization for the above dataset. 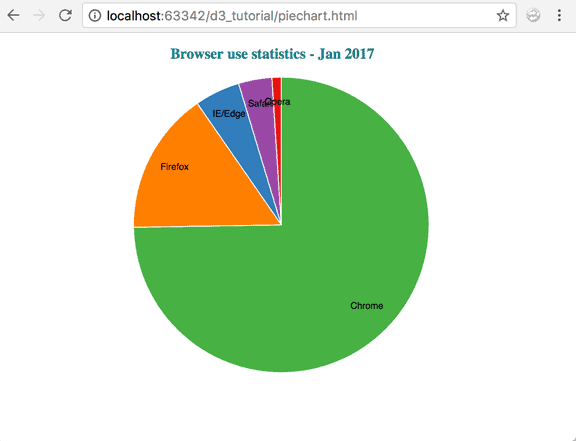 The above code will display the following pie chart. Next, we generate the pie. Since we want to plot the percentage values, we have used an anonymous function to return d.percent and set it as the pie value. Next, we define our arcs for each of the pie wedges. This arc will be set to the path elements. We provide the calculated radius to the outerradius and innerradius is set to 0. In addition to the wedges, we are also showing labels for the different browsers. We have this data in the 'browser' attribute in our dataset. Now that we have our arcs defined, lets read our dataset and start building the pie chart. 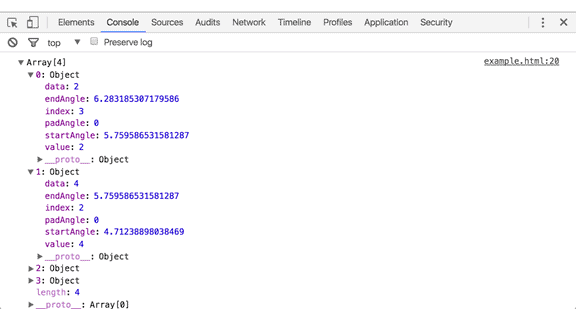 We load the data from 'browseruse.csv' and do the standard error handling. We want to create group elements for each of the data values in our dataset. We also assign a class 'arc'to our groups. After adding groups, we now want to add our generated arcs to create paths for each of the pie wedges. We append a path element to the group, and provide the arc defined earlier to the path's â€œdâ€ attribute. We also want our wedges to be colored using the color scale we defined earlier. So, we provide the style attribute "fill" and assign our color from the color range. And finally, we append the browser labels to each of the group elements. We use the SVG text element for our labels. The label arcs that we created earlier using d3.arc()returns a centroid point which is handy to position our labels. So we use this to provide a translation point to our text label. And then we provide our data using d.data.browser. We would also like to append a title to our visualization. We add another group element to hold this text. We apply a translation .attr("transform", "translate(" + (width / 2 - 120) + "," + 20 + ")") to position our text right above the pie chart. 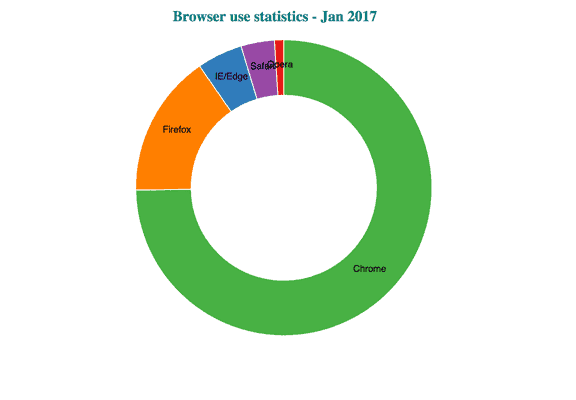 Next, we append the text element text("Browser use statistics - Jan 2017"). And finally, we apply a class'title'to color the text and make it bold. Thus, we created a pie chart from a dataset that was read from a csv file. An innerRadius > 0 gives you a donut chart.